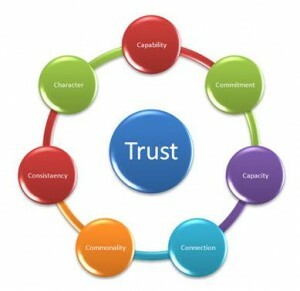 You are here: Home » Positive Relationships » What’s Trust Got To Do With It? Trust is fundamental to all relationships and we often use past experiences and information to guide us on whether to trust or not. If our past relationships have been positive, confidence and trust remain high. The opposite is also true because once trust has been shattered it’s a gradual process of rebuilding our self esteem, confidence and trust. The answer isn’t to build a fortress, rather to be selective about the company we keep. There’s that saying of “You have to give a little to get a little” and so it is with trust, learning from the positive and negative feedback that you receive. Consider your own family of origin and ‘the marriage script’ as a good starting point in building positive (or troubled) relationships. With this in mind it’s time to look at how we can trust after we’ve been hurt in love and matters of the heart. What were the warning signs ? – Learning from the past. traits, aggression, mood swings, substance abuse, violence, jealousy? Don’t assume the future will be the same as the past. Pistanthrophobia. Carrying around baggage called “pistanthrophobia” is pretty off putting in itself, and will ruin any chances of being in a positive and emotionally satisfying relationship. One sound piece of advice by a therapist was “Don’t cast aspersions on the entire female/male population because of one bad experience with one bad girl/guy.” Unless a person has done something to warrant us being wary of trusting them, they deserve to be given an open-minded chance. The clean slate approach comes to mind rather than being poisoned by past experiences. What were the things you could have done differently? Looking back, an important lesson is to trust your instincts. If something didn’t seem right then it probably wasn’t. Address your fears rather than dismissing them. By making better decisions it will become much easier to trust someone new. Time out! – Give yourself time to heal. After a difficult relationship break-up, it’s extremely important to take timeout from the dating scene and allow yourself time to grow in your pain. Learn everything you can from your previous relationship(s) so that when you do venture out again you are able to start afresh and be more informed. A relationship with no trust is like a cell phone with no service, all you do is play games. Show yourself some self-compassion so that you can be your best. Before we can be our best in a relationship, we need to be at peace with ourselves and be the best we can be…to be comfortable in our own skin and in our own company. If we rely on another person to validate who we are before we consider ourselves whole, it is time to reflect on our sense of self and take responsibility for discovering our unique qualities and what we can bring to a relationship. Sweet revenge is in living well. You can never have total certainty. By staying present in your relationships you will alleviate some of the ‘trust issues.’ It is natural to ask yourself the ‘what ifs’ but remaining focused on the here and now will help reduce the degrees of anxiety and uncertainty. It’s a matter of enjoying yourself now rather than being distracted by the fear of an ultimate betrayal in the future of your relationship. It’s fatal to assume. If you want to know someone then you need to communicate, ask questions, enquire into their history, likes, dislikes, passions. The early stages is when you find you will be ascertaining whether this person shares the important elements/codes of conduct that life requires; and that there is a solid foundation for a future together. Use open questions beginning with… who, what, when, where, how – rather than the yes/no responses given to closed questions. Healthy couples don’t avoid conflict, but know how to keep the lines of communication open. Take your time in getting to know the person you’re interested in. You are both investing yourselves in this relationship, so enjoy this journey. Meet each other’s friends, family, and socialize together. Make the experiences enjoyable, honest and fun. Rid yourself of distractions during your time with that special someone – turn off phones/mobiles, tablets and laptops. Saying please and thank you are important and should be practised at all times. Manners matter! Niceties will go a long way to maintaining a culture of mutual respect. Eating is a bonding ritual for families and couples; a time to connect and receive nourishment, both physical and spiritual. A time for sharing of ideas and views and to explore the lighter side of life. Practice sensuality and then sexuality. The early stages of a relationship require greater sensuality than sexuality. It’s a time of mystery, intrigue and fascination with each other. Why rush? The complications associated with leaping too quickly into a sexual relationship are too numerous to mention. Give each other space to grow. While there may be the urge to rush into a live-in relationship, this often happens far too soon. Again, take your time, get to know each other, and if you both agree that it’s time to take it to the next level of commitment then discuss it with the view to establishing a time frame around this mutually agreed decision. To make relationships work requires team work. If you are looking at sharing a home together, recognise that each must contribute towards the responsibilities associated with running a household. Swap roles – alternate your home duties – cooking, cleaning, shopping, and gardening. Remember the saying…”Happy wife, happy life.” No one likes being stuck in a rut. It’s true that you must give what you want to get in return. Arguments stem from our own fears. Women and men are not from Venus or Mars. We are unique – individuals trying to make our way in a complex world. Understanding and celebrating our differences will make living together more interesting, fun and peaceful. This is the most important ingredient for creating a healthy relationship. When people do not take responsibility for their feelings, they tend to try making their partner responsible for their own happiness, self worth and emotional safety. Self worth comes from how we treat ourselves and others. Relationships thrive when both partners are kind, accepting, compassionate and empathetic. When you can be all these things to yourself then you can convey this to those you love. In a healthy relationship there needs to be connection and also room for autonomy – room to grow.